Despite UCLA’s Principles of Community proclaiming that diversity is essential for the university’s excellence, it is hard to ignore the informal separation experienced by international students. Not only are international students likely to have social circles that are predominantly foreign, but these circles also tend to be limited to one’s ethnic or national group. This phenomenon is especially prevalent among students from Asia who often feel self-conscious of assimilating due to language concerns and are stereotyped as sticking to their own. As recent politics points towards a more nationalistic bent in foreign policy, international students may experience further alienation. This is more than a feeling; the numbers reflect these concerns. Despite the ever-rising number of applicants to U.S colleges, this last admissions cycle was marked by a significant shrinkage in one demographic pool: international students. According to a survey of 250 American universities conducted by the American Association of Collegiate Registrars and Admissions Officers and four other educational organizations, 39% of colleges experienced an overall decrease in the number of international applications at both undergraduate and graduate levels. At UCLA, the outlook is more optimistic. 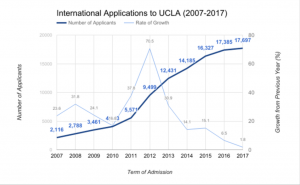 International applications to UCLA have increased by 1.8%. Although the exact number of applicants is not publicly available, when compared to data from the 2015-2016 application cycle, this estimates to 17,697 applicants: an increase of approximately 300 students. However, this growth pales in comparison to previous years. Within the last decade, the average rate of increase in international applications was 24.8% per year. Although application rates have slowed in recent years, decreasing to 6.5% in the 2015-2016 application cycle, a growth of 1.8% is unprecedentedly low. 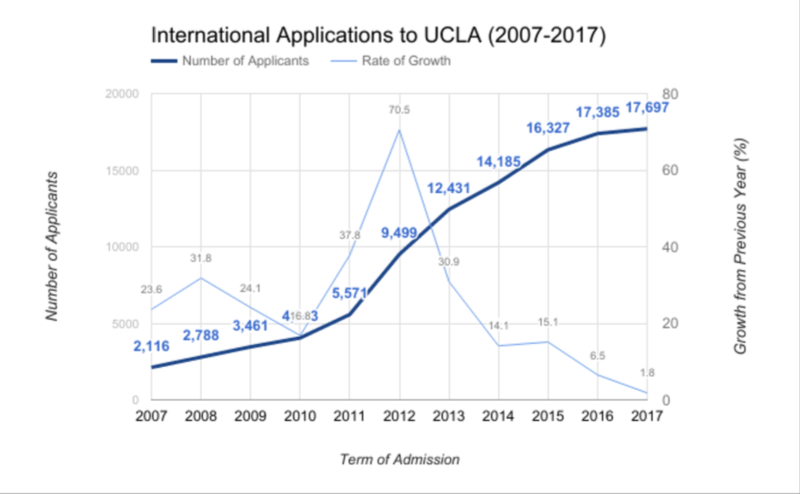 Data was obtained through UCLA Admissions website and compiled by the author into this graph. Correlating with this trend is increasing immigration restrictions issued by the U.S government, notably the two executive orders issued in January and March of this year. The executive orders issued by President Trump banned U.S entry of citizens of six Muslim-majority countries from the Middle East. In line with AACRAO’s survey data, 39% of participating schools reported a decrease in undergraduate applications. Despite the Middle East being the only region affected by legalized travel restrictions, the survey also reports a decrease in applicants from Asia. Undergraduate applications from India and China have fallen at 26% and 25% of colleges, respectively. At the graduate level, 15% of universities report a decline in Indian applicants and 32% for Chinese applicants. South and East Asia have been a long-acknowledged hotspot for recruiters. Indian and Chinese students constitute nearly half of students on F-1 visas in the U.S. 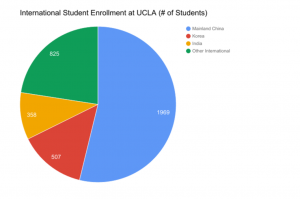 The three most populous undergraduate foreign student groups at UCLA come from mainland China, Korea, and India, constituting around 77% of the international student population and 9.1% of the total undergraduate population. Data was obtained through public data available at the University of California website and compiled by the author into this graph. It is uncertain whether the political climate is responsible for less international interest. Rising cost of college tuition, as well as the expenses of living abroad, could be a potential factor. The 2015-2016 application cycle also showed significantly less growth compared to years prior. Foreign policy’s true impact on international student application rates can be properly assessed in the successive years of the Trump administration. Whatever the numbers may be, the atmosphere of concern among international students is palpable. First-year cognitive science major Dorothy Duan remarks that “some people in China are afraid that there will be restrictions on entering into America” and that there is already a sense of greater rigidity upon airport entry. She notes that when the travel ban came out, there was heated talk on Chinese news and online media on how the new law could affect Chinese visitors to the United States. Duan, who is originally from Tianjin, came to UCLA for a new life experience. Despite this, she finds that international students tend to cluster into their own ethnic communities. When asked about how UCLA has responded to the travel ban, she believes that “there is no effective or strong communication between students from different countries” and hopes that campus organizations catered towards international students, such as the Dashew Center, can bridge this gap. Issues of xenophobia and immigration affect all international students, regardless of whether a specific region is targeted.The international student population is beginning to recognize their varied, but fundamentally similar concerns as potential common ground for collaborative resistance with the Muslim community. Whether this potential comes to fruition remains to be seen. Good post. I learn something totally new and challenging on blogs I stumbleupon on a daily basis. It will always be useful to read through articles from other authors and use a little something from their websites.